Three Rooms Press, 9781941110065, 235pp. 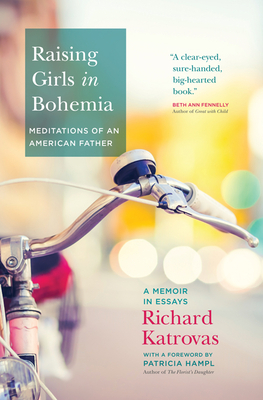 A provocative collection of personal and political essays by an American writer, Raising Girls in Bohemia chronicles the life of a father raising three perfectly bilingual, culturally bifurcated, Czech-American daughters. While tracing what fatherhood has taught him about the world, Katrovas delves into a range of intricately related yet far-flung subjects including fine dining, sexual epithets, gender identity, racism, poetry, and education, tracing the contours of his ignorance about all things. Through the course of these fine essays, Katrovas unveils what it means to be an American and to be a man, and especially what it means to be a father of three daughters, born in Prague, in what we can only hope is the twilight of patriarchy. The recipient of numerous grants and awards, Richard Katrovas is the founding academic director of the Prague Summer Program, and is the author of seven collections of poetry, a short story collection, a novel, and three memoirs. Katrovas taught for 20 years at the University of New Orleans before moving to Western Michigan University. He divides his time between Kalamazoo, MI, New Orleans, and Prague.